I recently spent a fascinating two days in Durham, NC attending this year's PAQA-S Spring Conference. Our speaker, Alyson Stanfield, led an extraordinary "Shameless Self-Promotion" workshop on the art of marketing art. 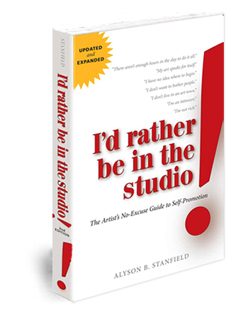 Alyson, a former museum educator and curator, is the author of I'd Rather Be in the Studio (the artist's no-excuse guide to self-promotion) and has a successful career as an art business coach. She's definitely a model of terrific marketing. Case in point, her website and blog are treasure troves of information and good reminders for artists at any stage in their marketing careers. I Can't Do It All! Next on the agenda...a guided tour through the steps of comprehensive, soup-to-nuts, promotional planning. Not surprisingly...the workshop attendees were part of the bonus of attending the workshop. We had about 50 folks there...and not all of them fiber artists. Mixed in with the fabric-addicted were ceramic and wood artists, a good handful of painters, a children's book publisher , and, of all things, a professional Santa Claus (and yes, he really looks like that - minus the costume - in real life). It was a lively group and Alyson's presentation was informative, fun, and engaging. PAQA-S Part II: a post for another day!